It’s been snowing off and on for the last few days. In self-defense, we’ve kept a roaring fire going, a not-insignificant accomplishment since we’ve been burning green wood. By Saturday afternoon, we had an impressive bank of coals in the fireplace, just right for grilling thick Tuscan-style steak. We headed out to the store to buy the best steaks we could find. We rarely eat big chunks of meat, so in honor of the decadent occasion, we decided to throw dietary caution to the wind. I mixed up a compound butter seasoned with Roquefort, rosemary, and garlic to top the steak. For fireplace grilling, we use a simple folding grate and set it up directly over very hot coals. If the fire is flaming, all the better; just be sure to turn the meat often so it doesn’t burn (long tongs are perfect for this task). The final result was amazing. Seared brown on the outside and rare on the inside, the steak was everything we could’ve hoped. 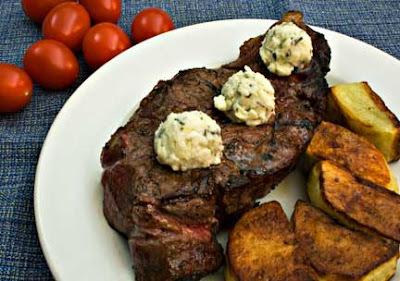 The rich flavor of Roquefort-Rosemary Butter was a lovely finishing touch for our perfectly grilled steaks. 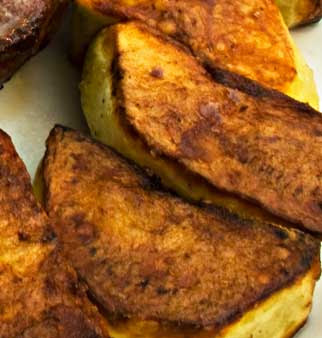 To accompany the steaks, I made simple Oven-Roasted Potatoes. These are the potatoes I turn to when I need to cook potatoes at the last minute and want something fast and reliably delicious. The potatoes are great for mopping up the melted Roquefort-Rosemary Butter and meat juices left on the plate when you've had your fill of steak (don't feel obligated to eat the whole steak; it makes terrific left-overs). The key to this dish is cooking the meat over a very hot fire, and regularly turning the meat. Instead of Roquefort butter, Tuscan-Style Grilled Steaks are also excellent with a little fresh lemon juice squeezed over them at the table. 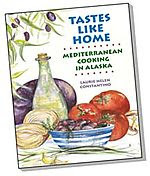 Tomato salad, made with juicy fresh tomatoes, is a nice balance for steak and potatoes. Liberally season both sides of the steaks with salt and freshly ground black pepper. Let the steaks sit at room temperature for at least 30 minutes. Using a fork, mash the Roquefort and butter together. Add rosemary, garlic, and lemon juice and continue mashing until the mixture is smooth. Divide the mixture into sixths and shape into small balls. Let the grate heat up over the fire for five minutes, or until it is very hot. Put the steaks on the grate and cook, turning regularly, until the steaks are done to your liking. For rare steaks, cook them 3 – 5 minutes on each side. Plate the steaks, top with the Roquefort-Rosemary Butter (or lemon wedges), and serve. When I’m using potatoes with unblemished skin, I don’t bother peeling them. If you want to make more potatoes than will fit as a single layer in the frying pan, brown them in batches on the stove, and then put the browned potatoes in a larger pan for oven-roasting. Peel the potatoes and cut into 2” chunks. In an oven-proof frying pan (cast iron works best), pour in enough olive oil to lightly coat the bottom of the pan. Brown the potato chunks in the olive oil. Put the pan and potatoes in the oven, and roast until the potatoes are cooked through (easily pierced by a skewer), about 10 – 15 minutes. Serve immediately. This looks absolutely delicious! But, that first pic? With the grill? Wow!! That really looks delicious. The pictures look amazing too! Wow -- that is an old-world, classic Tuscan meal, and I have wonderful memories of eating dinners just like that in Tuscany. Time to start building fires in my fireplace, I guess! ohhh fabulous! isnt grilling on the fireplace fun? we make our morning toast that way too, its got a nice wood flavor to it. we need big hearthy meals like this on cold snowy nights and with a wonderful roquetfort butter and rosemary potatoes, that is the creme de la creme! Yes, once in a while, one must throw caution to the wind...that butter sound delicious. I really have to try this! Whenever we light the fireplace I always feel that all this coal is going to waste...We usually bake potatoes, but never a steak! 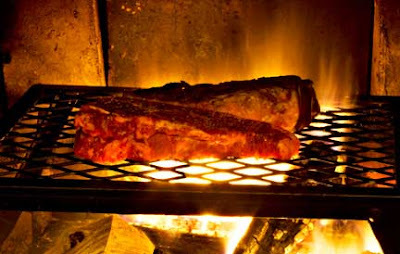 The fire, that big hunk of meat -- that's hypnotizing! Peter, sounds wonderful. Fresh lemon juice goes so well with grilled meat. Med/Turkish Cook, I'm so glad you liked it! Lydia, yes, you had better start building fires in your fireplace. It's simple to cook steaks that way and there is virtually no clean-up. Maria, men and meat, a match made in heaven. Riana, it's funny you wrote because I was thinking about you when we were doing it! And, oh my - morning toast done on the fire? Sounds incredibly good. Joan, I'm a roquefort junkie! Jo, you definitely need to try it. Very easy and oh so good. Nuria, one thing Alaska has is plenty of winter! I think you should forget the roquefort and eat the steak with a squeeze of lemon. That's what I'd serve you and my father, the only two people I've ever known who hate cheese! js, all fires are hypnotic! I love them. Fireplace grilling is awesome, resourceful and yields great results. The only caveat is to allow the embers to cool a bit and the temperature can be a bit high for grilling. Wow! I'm just starting to go back through your archives and drooling into my coffee already. Love your throw caution to the wind attitude when it comes to being "bad" -- we do the same when it comes to indulging in hunks o'meat, go for the gusto with proper potatoes and roquefort. Can't help but wish for a side of your limpets casino to start, too!